Does a temple have to be built? At the time, there was not a Temple in site. Must a Temple be built? Did not have to be in this case. What is your point? I simply said that i agree that a temple will be built. A temple has not been built yet so therefore it is not a fact, it is my opinion that a temple will be rebuilt. I'm pretty sure that I read a scripture that said that the anti-Christ can not be revealed until after he goes into the temple and sets himself up as God, and then the abomination of desolation wherein he desecrates it somehow, then he is revealed. I will look for it later. Meantime, they are talking about rebuilding it even now, and everyone seems to agree that it should be built on both sides, for it will be a place for all nations to come to pray. Recent overhead IR pictures are suggesting that ruins underground are indicating that it does not to be built upon the dome of the rock, but about 100 yds north of it, so that shouldn't be a problem if they do not have to disturb the Dome. Study the Law. Study the Feast Days. Then work your way into the Prophets. After a while - Revelation will make perfect sense to you. The major reason why most preachers today don't get it - is because they have turned their blinders on to the Law. uhm no.i know men whom do believe that and have great understand of the torah. I disagree because I don't believe in schofieldism. I don't believe in the ac, nor the millennium. The Jerusalem Covenant was signed by the leaders of Israel in May 19th, 1993. It basically states that Jerusalem belongs to the Jews. If a world leader like Cyrus or Artexerxes "confirms" this Covenant, it would allow them to build the last temple. It was a World Governing King [Cyrus] that caused the prophetic clock to start Daniel's 70 weeks. So it will be with Daniel's 70 th week. There are those who believe a Temple HAS to be built in order for these prophecies to come to pass. The verses quoted show that a building need not be built for sacrifices to begin and an abomination set up. 2 Thess 2:4 says, -"sitteth in the temple of God". Any earthly building couldn't possibly be "the temple of God", not since Jesus came! Jesus himself is the cornerstone of the last and final temple, the apostles are foundation stones and we the christians are living building blocks, and that temple is the only temple of God; Matt 21:42, Mark 12:10, Luke 20:17, Acts 4:11, Eph 2:20, Rev 21:14, Rev 3:12, 1 Peter 2:6, 1 Peter 2:7. Eph 2:21, 1 Cor 3:9, 1 Cor 3:16-17, 2 Cor 6:16. Christianity is God's people, the restoration of Israel is done in Jesus*; John 11:52, 2 Cor 6:16, 1 Peter 2:9, Heb 8:10, Rom 2:29. Since the false Jesus(prophet) will be the head of christianity and since AC is ranked above him and christianity is the temple of God. AC will automatically, without taking seat in any earthly temple, be fulfilling 2 Thess 2:4 to the letters! "Who opposeth and exalteth himself above all that is called God, or that is worshipped; so that he as God sitteth in the temple of God, shewing himself that he is God.". AC won't fulfil Dan 12:11 or 2 Thess 2:4 until in the middle(three and a half years) into his seven years rule. Because that is when the false Jesus(prophet) will be inserted. This I said about the AC and the false prophet is even more eyebulgingly interesting when studying the islamic prophecies about who the muslim Jesus(Isa) and messiah(Al Mahdi) are, and what they are supposed to do, when they arrive. Islamic hadiths(prophecies) say that Al Mahdi will rule the entire earth for seven years. Sometimes during his rule, Jesus will descend, in Syria, carried by two angels. He will be ranked below Al Mahdi. And he will perform miracles. And he will "correct" the christians and the bible. -He was never crucified. -He is only a prophet and not the Son of God. A Temple is not going to be rebuilt. The Dome of the Rock sits in its place and it will be there when the Messiah returns. One Pope has already done the impossible, enter the Dome of the Rock Mosque. Another Pope will be able to enter it as a brother to Islam, I say this because Islamic Clerics and Catholic clerics are slowly but surely establishing a brotherhood. Islamist believe Jesus is a great prophet who will come with the Mahdi at the end of the age to restore all things. Israel has a secular government. "Orthodox Jews" and others who have plans to build a temple are a minority group with no real political power whatsoever. 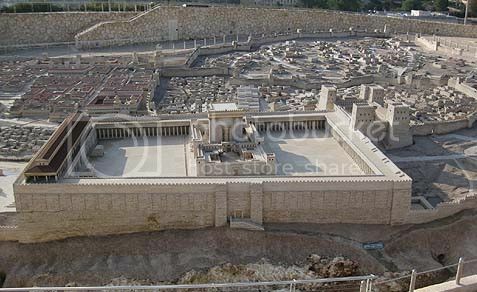 The government of Israel has no plans of building a Temple. You may be right about the temple...we will just have to wait and see. The leaders of the Islamic world and the Catholic world already have a brotherhood...it is called Freemasonry. If a temple is rebuilt...it will probably be Masonic. Not to be argumentative here, but if God decides a Temple will be built in the end times, it doesn't much matter what the Israeli government, what the Vatican or what Isalm thinks, feels or decrees. It will be built. That being said, it is not imperative that a building be erected for the prophecies to be fulfilled. Mat 24:3 And as he sat upon the mount of Olives, the disciples came unto him privately, saying, Tell us, when shall these things be? and what shall be the sign of thy coming, and of the end of the world (age)? How do we know that this is for the end time? Daniel's prophecies were for the end time. These things are the sign that Christ referred to in the Olivet Prophecy and He directly referred to as being "spoken of by Daniel the prophet" indicating they would be seen at the end in the way that Daniel recorded them. This sign has been applied to the Temple of God as the church but I think that is a stretch. The way Christ referred to it shows it occurs in a literal manner. I would suggest a slight amendment to your statement, Ezekiel's temple that is built during the Millenium is the third Temple. I would suggest a slight amendment to your statelement, Ezekiel's temple that is built during the Millenium is the third Temple. When not taken out of context - Ezekiel chapter 37 and onward are easily understood. Ezekiel 37 is covering the first resurrection. Ezekiel 38 and 39 is covering Armageddon. 40 and onward is describing the New Temple aka New Jerusalem. Ah but of course the Millenium. I don't subscribe to it. I see this as one day. Meaning, Satan is bound for one day and Christ Rules for one day. Another way to say it, Christ descends to Earth, ascends the Holy Mount Zion with all of his saints and Rules for one day there. Satan is bound for a day giving world leaders an opportunity to maker up their minds. After a 24 hour period, 1 day, Satan is loosed for about 8 to 9 days. In which he will convince man to turn against Christ, since man will not think he is Christ anyways by then, so why fear fighting God eh? Ezekiel 40 this is after the present system is destroyed. Ezekiel 37 is covering the first resurrection. Ezekiel 38 and 39 is covering Armageddon. Here is Israel after the decimation of the Time of Jacob's trouble, after being brought back to the land fomr all the nations they will be scattered in. Eze 38:9 Thou shalt ascend and come like a storm, thou shalt be like a cloud to cover the land, thou, and all thy bands, and many people with thee. 40 and onward is describing the New Temple aka New Jerusalem. It really is one thousand years. I don't see, in scripture, a temple being built. I only see truth being thrown to the ground and the temple trodden underfoot--but a literal temple being rebuilt...I don't find it in scripture. If "they" want a temple rebuilt ... it would only take a "wing". And as far as I know..."they" are already doing that. Revelations 20, states that Ezekiel 38-39, is Gog and Magog...which is after the millenium. Those of the spirit and thinking of Gog and Magog. Eze 39:22 So the house of Israel shall know that I am the LORD their God from that day and forward. Now Israel knows this when? Israel knows God starting at the beginning of the Millenium. Happens twice. Took me a while to learn this, but once I did, it put to rest all the little differences between the two. They came out, they and all their armies with them, http://www.biblestudytools.com/nas/joshua/11.html#cr-descriptionAnchor-6as many people as the sand that is on the seashore , with very many horses and chariots. I see this as also a type for the final battle at the end of the 1000's years when satan is released.